Ed. 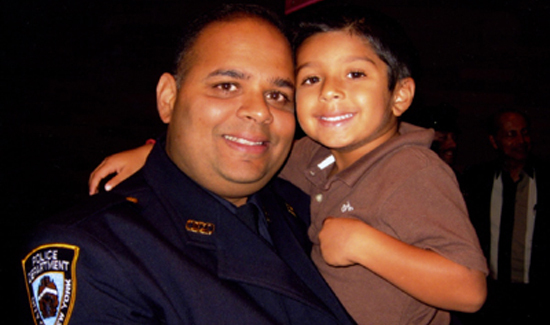 Note: Today we bring you Part II of NYPD Detective Sam Panchal’s incredible story of service, excerpted from the pages of the best-selling book Brave Hearts: Extraordinary Stories of Pride, Pain and Courage, by American Police Beat publisher Cynthia Brown. Missed Part I? Click here. At first the NYPD thought the only victims of the scam were the innocent people who were watching their insurance premiums go through the roof. The insurance companies were paying on the bogus claims, taking these massive losses and passing them right on to the consumer. That injustice alone was enough to fire Jimmy and Sam up for the mission. But when Sam was told by the boss to find people on the street and offer them twenty five dollars for each X-ray and then tell them they had to do it five times a day, they realized there was another group of victims—people whose lives were threatened. On paper, Sammy didn’t look like he was ready for such a complicated, dangerous assignment. He was young and had only been on the job a short time. The last two years he worked in a radio car in the South Bronx. But like most people who meet Sam Panchal, Detective Jimmy Feasel was impressed. When he learned Sam speaks three Indian dialects—Hindi, Punjabi and Urdu—it was even better. But understanding a different culture is one thing and being ready emotionally for work of this intensity and risk is another. Jim admits he was worried about sending this young cop on such a dangerous assignment. But the insurance companies were demanding something be done and Sammy was their only hope. Once Sam was approved for the assignment, the NYPD began to construct his new identity. Every law enforcement agency goes to great lengths to protect their undercover officers and the NYPD does more than most. Within weeks, Officer Sam Panchal of the New York City Police Department, ceased to exist. His name disappeared from the vast bureaucracy and for almost a year he picked up his paycheck in cash, always at a different location. For a year, his life was totally transformed and not for the better. He was forced to retreat into a shell which was not easy for such an outgoing, gregarious twenty three year old who loved nothing better than to go out with his friends, have a few drinks and smoke a cigar. New Year’s Eve, 1997. Left to right: Det. Jose Manjarres, Sam’s first partner when he got assigned to the NYPD’s TARU Unit; Sgt. Louis Vozza, Sam’s supervisor for several years; and Sam. At first the scam seemed simple—filing insurance claims on behalf of people who didn’t exist for accidents that never happened. Thousands of claims were filed for visits to doctors who didn’t exist, travel expenses for trips that weren’t taken, massages that were never given and prescriptions that were never filled. A limousine company was the front. As they went back and forth at some point Sam sensed he had to take more control of the interaction. “I told them to take it or leave it,” he said. That approach seemed to work. Sam got hired. At first the NYPD thought the only victims were the innocent people who were watching their insurance premiums go through the roof. The insurance companies were paying on the bogus claims, taking these massive losses and passing them right on to the consumer. That injustice alone was enough to fire Jimmy and Sam up for the mission. But when Sam was told by the boss to find people on the street and offer them twenty five dollars for each X-ray and then tell them they had to do it five times a day, they realized there was another group of victims—people whose lives were threatened. Right up until the morning they were arrested, the bad guys never knew Sam was a cop. He finally convinced them he was Pakistani, not an easy feat when you’re Hindu. He had to keep reminding himself not to wear his OM, a cross-like symbol of Hindu affiliation. It didn’t take Sam long to start rising up through the ranks of the criminal enterprise. He started out as a street level guy—a runner looking for people to be X-rayed. By the end of the investigation he was hanging out with the man who ran the whole operation. His job description got more diverse. He no longer spent all his time hustling people off the street to get X-rays. He was setting up phony marriages and getting bogus green cards. “At least once a week someone would ask me if I knew an American girl who would agree to marry one of their friends. The price you had to pay for a fake marriage to an American was ten thousand bucks,” Sam said. The organization was running five clinics in Queens. They processed people all day long. The phony medical clinics assigned phony names to the X-rays. Then they were sent to phony law firms who then filed claims with the insurance companies. It wasn’t long before the cops knew this was going to be way bigger than a simple auto insurance scam. Over the eight months that Sam was undercover, Jimmy watched over him like a big brother. One day the boss of the New York operation rented a lavish yacht for a birthday party for his five-year-old daughter. He insisted that Sam go. Sam was willing, but Jimmy was opposed and the department agreed. Sam would be out on the water, all by himself and that was too dangerous. Together they came up with a plausible excuse why Sam was unable to go on the boat. Sam knew the investigation was spreading and law enforcement agencies in other parts of the country were getting involved. 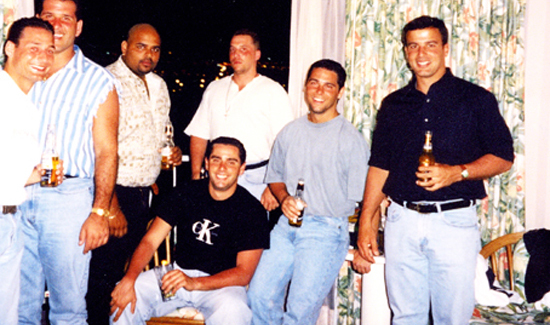 What he didn’t know was the FBI had put so much pressure on the Virginia wing of the operation, some of their top people were sent up to New York to avoid getting arrested. Now there were people Sam didn’t know asking who he was and where he was from. “They patted me down, but I came right back at them. I asked who they were and what they were doing.” The approach seemed to work. After a few weeks, the Virginia contingent left him alone. When things got really intense, Feasel was a master at calming Sam down. He knew his job was to try and keep the young cop relaxed and focused. The thrill of knowing they are getting close to taking a bad guy off the street or saving an innocent person from harm always makes a cop’s heart race. When Jim and Sam realized they were about to blow the lid of a medical insurance fraud scheme that involved hundreds of millions of dollars and criminals from coast to coast, the adrenaline was definitely raging. When it became apparent that the crime ring extended across the country, the FBI, state and local agencies, Immigration and the ATF worked together to coordinate the arrests. Sam accumulated an overwhelming amount of evidence. “We had pictures, we had videos, we had tapes of phone conversations—over a hundred in all,” he said. The evidence was so overwhelming that when the arrests went down and the suspects found out that Sam Panchal was a New York City cop, every person arrested pled guilty. The case was a prosecutor’s dream. When the year-long operation was over, a one hundred million dollar scam involving much more than auto insurance fraud had been uncovered. Over one hundred people were arrested by federal and local officers in an eleven state, pre-dawn sweep.